I’m spending a few hours hanging out where there’s some free wifi and hoping to upload another post before I have to head to the airport. I had intended to post something further about Berlin (there are actually a few posts I’d like to write) but I decided instead to post some photos from an exhibition I was lucky enough to get to see here in London. 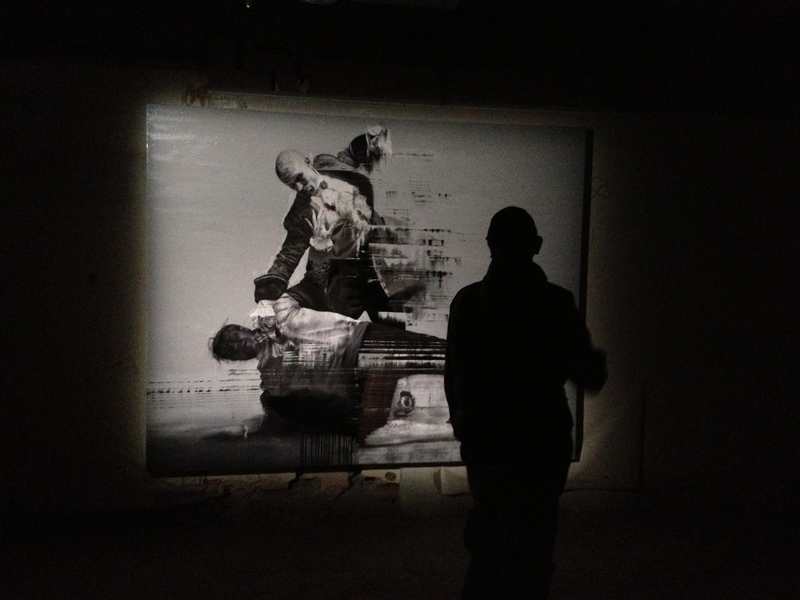 ‘Brutal’ is a group show organised by Steve Lazarides and the Vinyl Factory, scheduled to run during London Art Week, as with previous group shows over the last several years. For each of these shows Lazarides selected sites outside of gallery space, sites that enhance the ‘urban’ dimension of the artists or artworks that he includes. 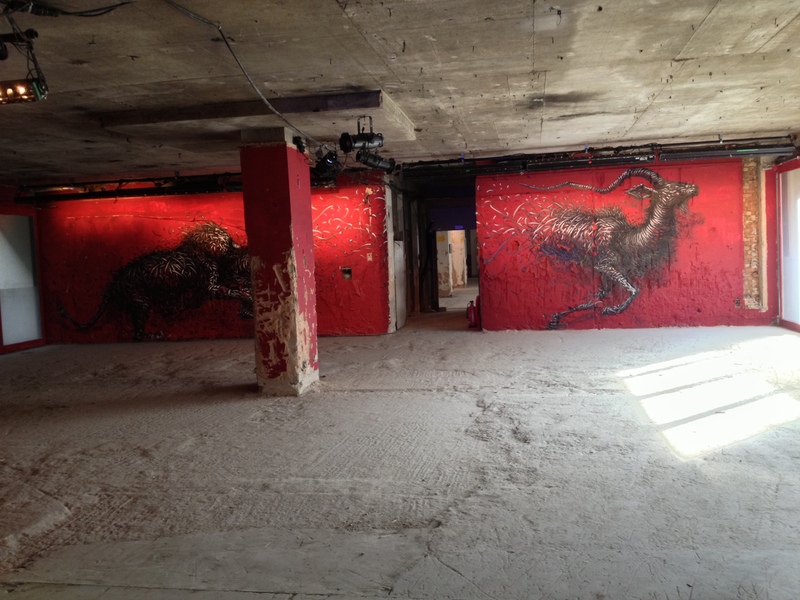 This year’s show is no exception to that, located at 18 The Strand, a disused office building. the building is next door to Kings College and on one of London’s busiest thoroughfares, but once inside, the noise and bustle disappear, leaving the visitor in a space filled with shadows, plaster dust and silence. And there is an entire room painted by Lucy McLauchlan. 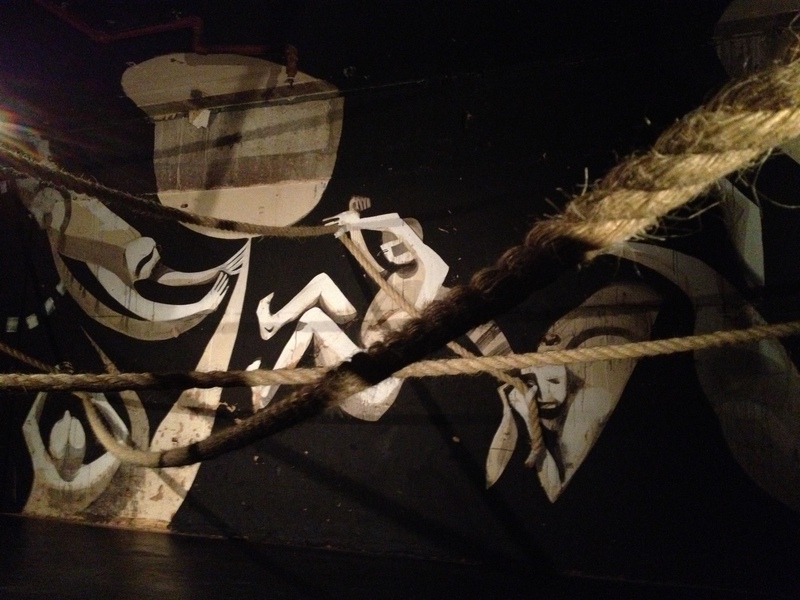 Lucy’s work is often intensely decorative; here, the piece retains that sensibility but a harder edge has been added through the installation of rope and the claustrophobic atmosphere of the room through which the figures swing. 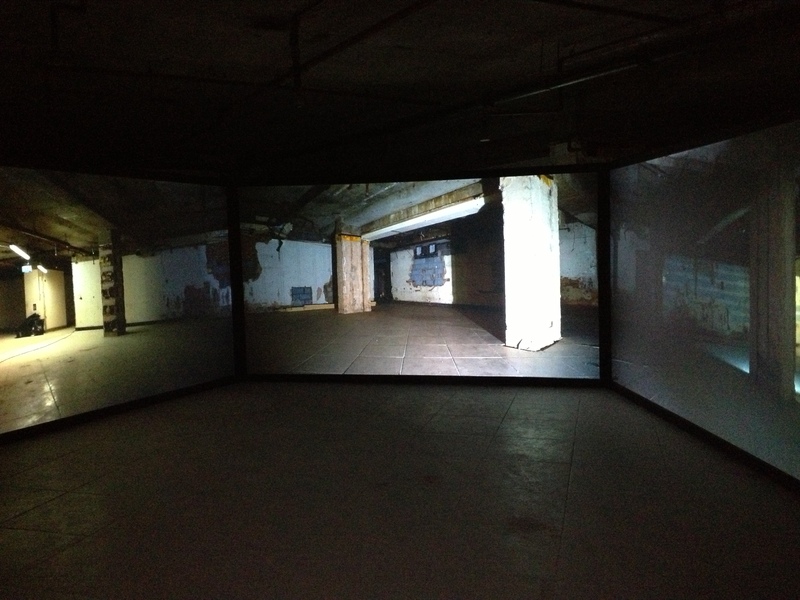 You can climb under the ropes to view the walls from all angles, and the ropes add new sightlines within the space…. In addition to these, you could wander into a room filled by Mark Jenkins’s sculptures (and if you were lucky, discover the one hidden in a pile of rubble near the Todd James video piece), you could be tormented by gas mask-wearing performance artists on bicycles, and you could eat miso soup supplied as part of Brad Downey’s installation, ‘Tarpaulin Cafe’. I made two visits to this show, and I still think I didn’t find all of the artworks that may have been hidden away in the shadows. 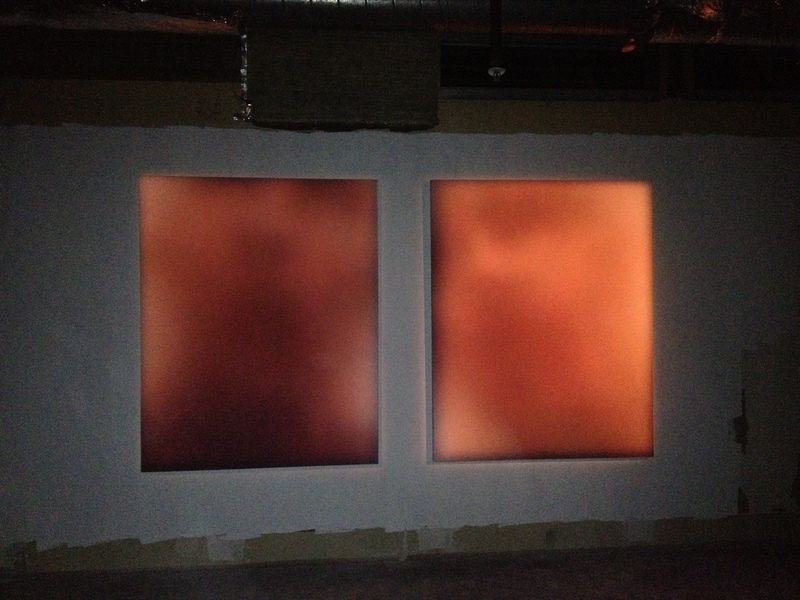 Both times, i spent much longer in the space than I imagined I would. Both times I found artworks of great beauty and skill (along with some that left me less enthused). I haven’t been to any of the previous group shows, so I leave it to others to debate whether this one is ‘better’ or ‘worse’. Whatever, it’s an undoubtedly fascinating experience. I first visited Berlin a few years ago, and, like so many people, I was struck by how many people pass through the city, attracted by its aura of easy-going coolness. Some are tourists, some are artists,some are backpackers who appreciate the low cost of living, some are academics…Berlin is like a nodal point in the flows of people in and around Europe: most people, at some point, travel to Berlin and fall in love with something about the city. Like so many, after i visited, I wanted to return, and did so this month. 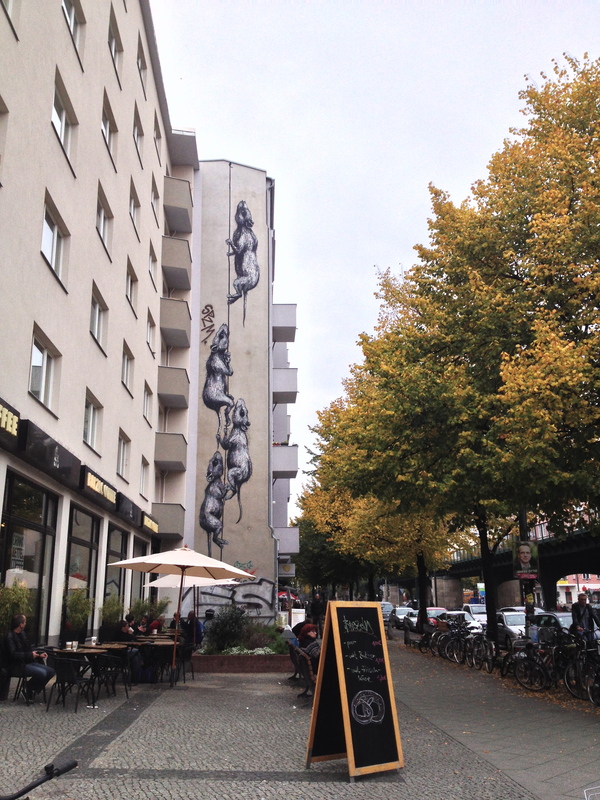 I was struck all over again by Berlin’s coolness and relaxed creativity, but I also thought that something had changed. There is now a more noticeable sense of tension in relation to the many visitors who flow in and out of Berlin. This manifests in various ways. Local residents told me that there is a lot of tension in gentrifying areas, where bars and backpacker hostels have opened up, with residents repeatedly calling the police to complain about noise. Individuals running the various walking tours around Berlin neighbourhoods report that locals often make angry or aggressive comments as they pass by (and this happened to the ‘street art walking tour’ that I went on, as we walked through Kreuzberg). Visitors, whether tourists or outside investors snapping up cheap property, are seen as key contributors to the gentrification process, which results in rents going up for locals and communities either fragmenting or being displaced. there is perhaps a little less warmth towards visitors in some areas than there might have been a few years ago, especially in those areas where gentrification is actively underway. There’s lots more to say in relation to the complexities of what’s happening in Berlin, but it’s interesting here to look at the various visual traces of the tensions around ambivalence (or sometimes even antagonism) towards those who visit Berlin. 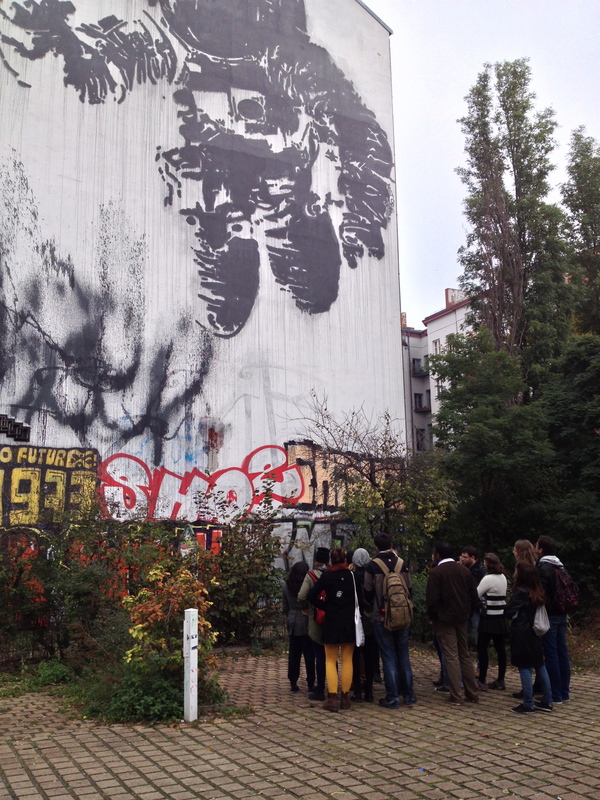 Here’s a tour group, being introduced to the enormous Victor Ash mural in Kreuzberg. The guide was earnestly explaining to the tourists that having this mural on the building will increase the building’s value. 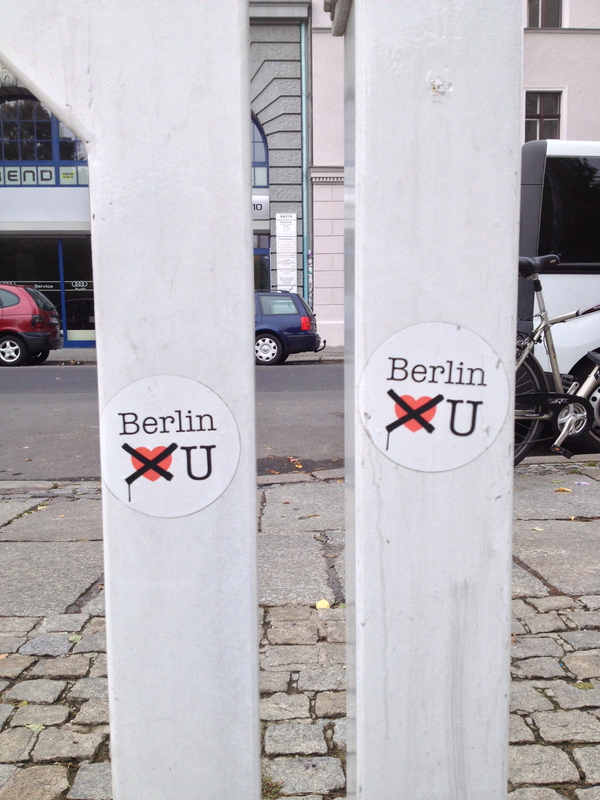 All around Berlin, you can find these stickers, revisions of the ‘I heart Berlin’ (or New York or London or wherever) tourist cliché. 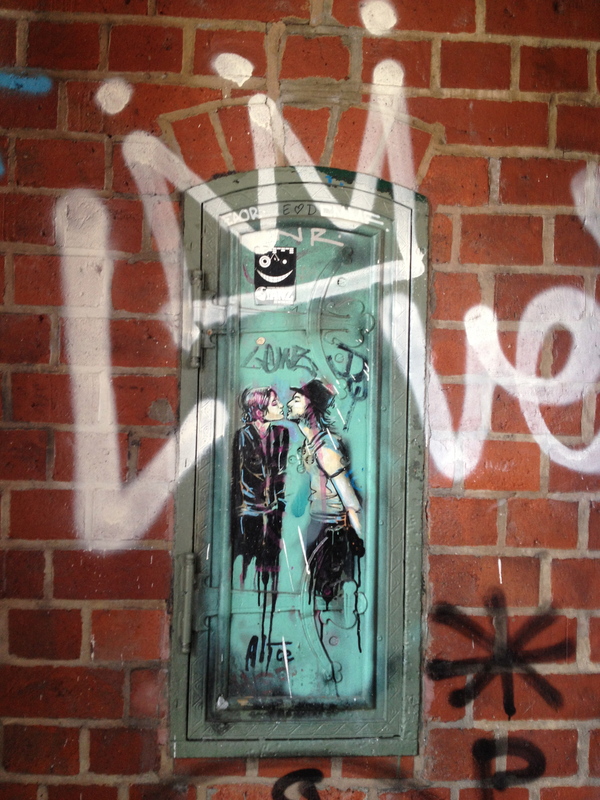 They read ‘Berlin Doesn’t Love You’. These ones are located right next to the Victor Ash mural, a site at which almost every walking tour will visit. Another sign of the ways tourists make problematic incursions into the city: property investors buy up all or most of the apartments in a building and rent them to tourists/ short-term visitors. 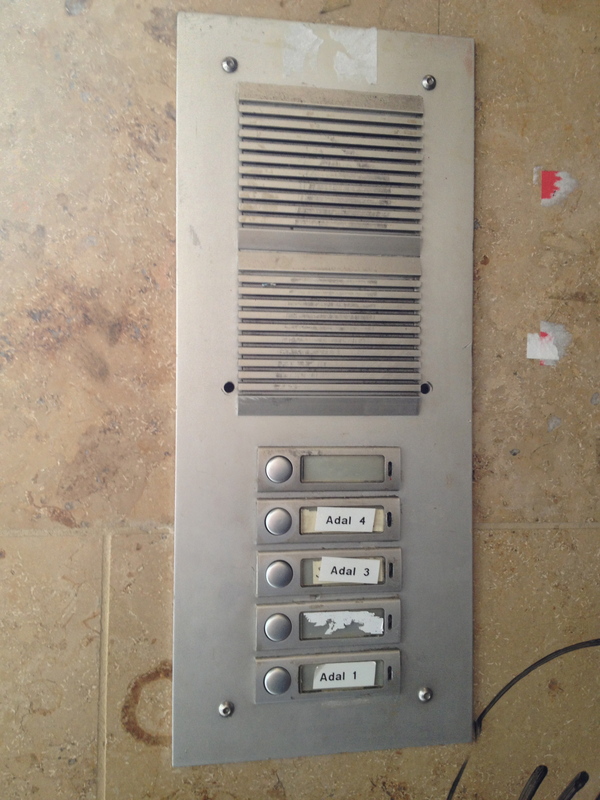 The names of individuals next to entry bells disappear; instead all you can see here are the agency codes for each apartment. Previous residents will have been bought out; any community within the building has been destroyed. As part of the investor’s control of the space, the facade is now rented to approved advertisers, whose ads are taped on to the outer hoardings, with tape proclaiming that unauthorised additions will lead to prosecution. Sigh. At the same time, of course, since spaces can never be entirely tied down in the way the company obviously hope, various individuals have added tags and other ‘unauthorised’ images. You can see a pasted-up poster that speaks of ‘reclaiming our city’ and you can see a lot of these political posters, protest slogans and anti-gentrification graffiti around the city. 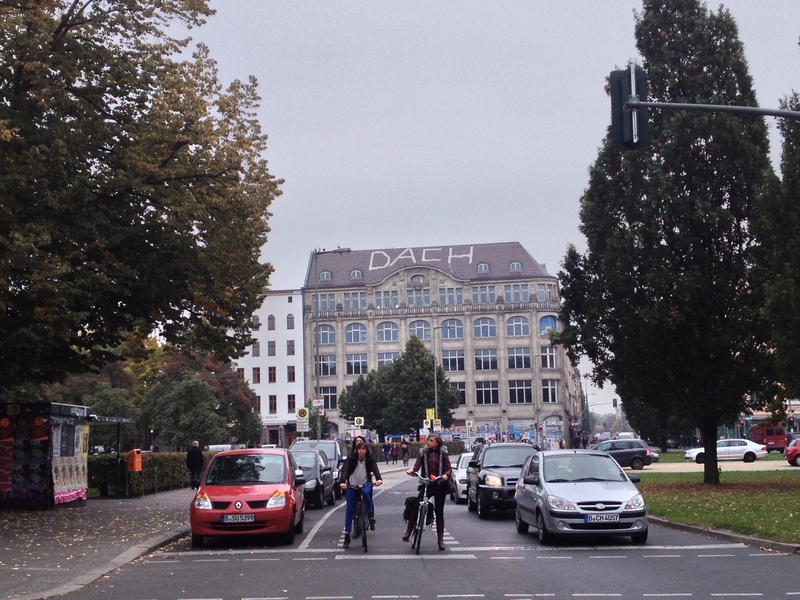 So, like all cities, Berlin is in flux, undergoing change. But the ways in which it is resisting and contesting those changes are writ large on the surfaces of the city. As mentioned in the previous post, I have been in Berlin recently. I spent ten days there researching a bit of what’s happening in the street art scene there, with a particular interest in the ways that neighbourhoods associated with street art are starting to change: this can be called gentrification, and such a term certainly covers some of what’s going on, but there are also other features to the social changes taking place (one of which is called ‘touristification’, and more on that another time). It’s three years since I was last in Berlin, and much has changed, while other aspects were pleasurably familiar. In 2010 I was struck by how many artists from outside Berlin visited, drawn to its creative scene, and sometimes stayed on, becoming more than a visitor. Anyway, during my visit there, ‘residence’ was a frequently occurring theme: who lived in which neighbourhood, for how long, what made someone a ‘real Berliner’, and what effects the many thousands of visitors per year have on Berlin’s identity, income, and atmosphere. I felt very conscious of my visitor-status there, and a little more uncomfortably self-conscious than in the past. But the conflicts and tensions around Berlin’s many tourists and visitors is a topic for a later post. 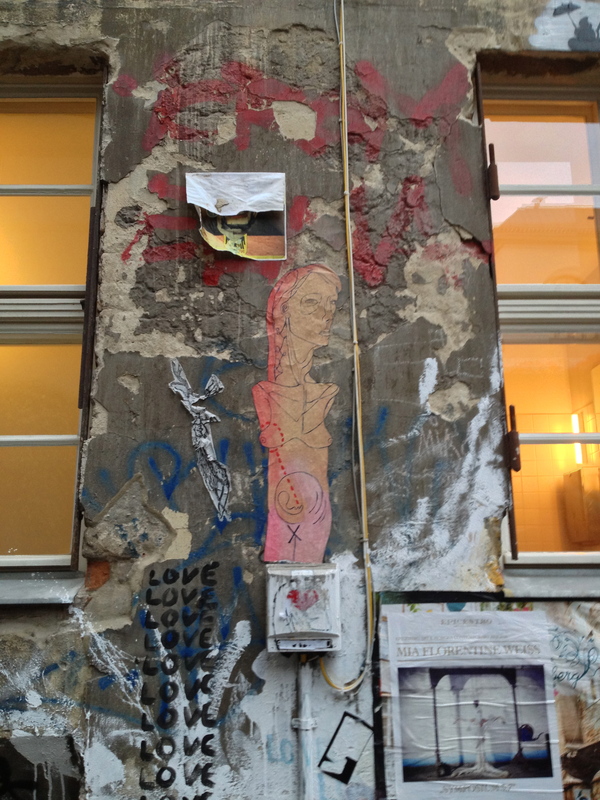 For now, here are some of the works left by Berlin’s recent visitors to its streets. 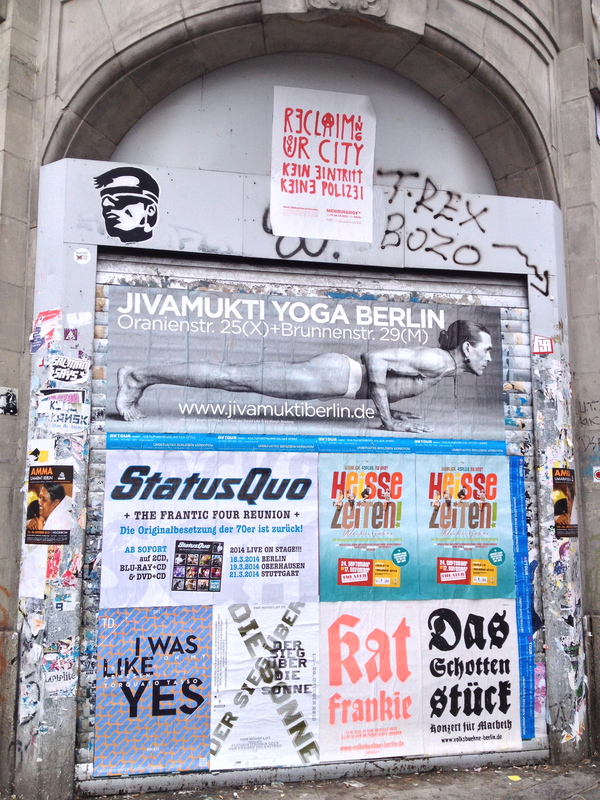 I’ll write more about the tensions around ‘visiting Berlin’ later…. 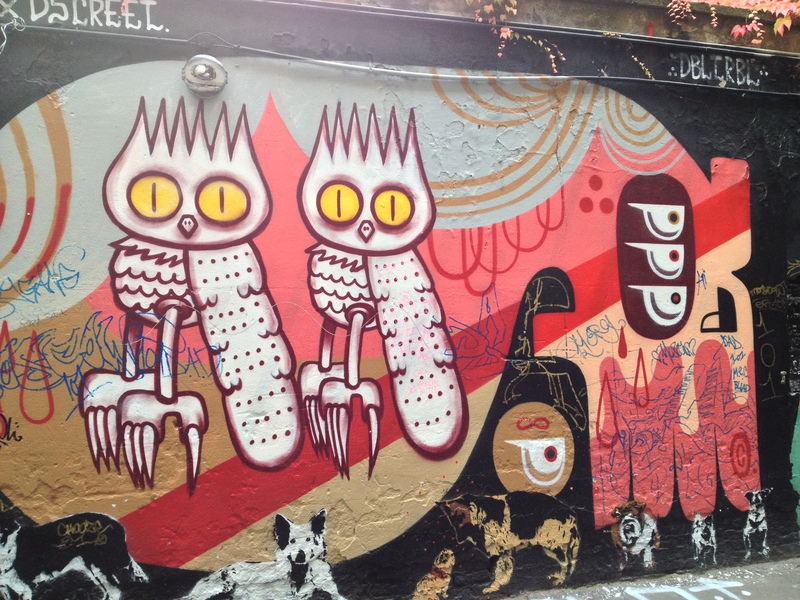 I have been writing and editing and re-editing my book on street art, law and the city, and, as I have mentioned before, whenever I am immersed in academic writing I find it hard to switch my brain into blogging mode. I’ve also done a year’s teaching, compressed into the months between April and August. And I’ve been travelling: I spent 3 months in London (with trips to Paris and Istanbul), and have been back to Berlin recently, and am currently in London. 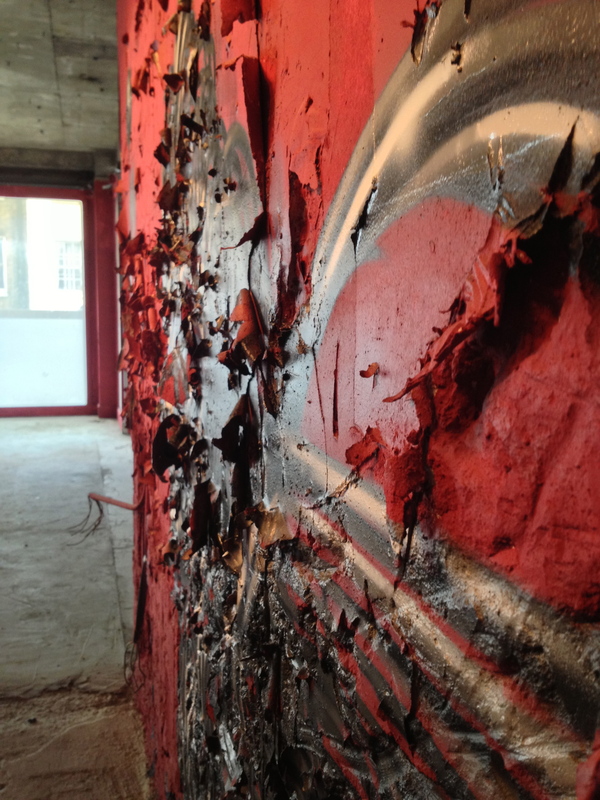 Much of this has involved fieldwork for further research – this time on the uptake of street art in cultural institutions, the art market, architecture, and so on. More on those issues later. I’ll post some photos from recent trips soon. In the meantime, here’s a link to my upcoming book, Street Art, Public City: Law, crime and the Urban Imagination. The publisher, Routledge, like many academic publishers, is bringing out a hardback edition first, with a paperback to follow (in about 8 months). This is kind of frustrating for me, because hardbacks are expensive. So when you click on the link below you will see that the book is pretty pricey. If you feel inspired to order it, you can reduce this hefty price a little by entering the discount pre-order code LAW202013 at the checkout. I’m excited to see it finally in print; if you read it, I hope you find it interesting.